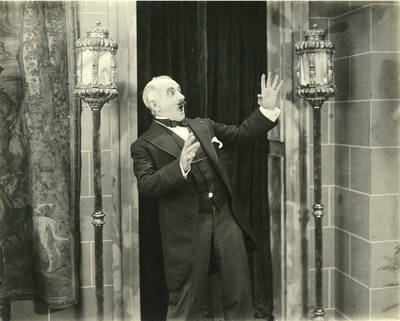 "Monsieur De Ronsard (Reginald Barlow), Love's Flame, 1920"
Love's Flame; Carrigan, Thomas J.; Osborne, Vivienne ; Silent films; Motion pictures; Dramas; Fidelity Pictures Company; Gregory, Carl Louis; Harrison, Louis Reeves; Williams, Cora; Rene, Alexander; Hall, J. Albert; Roccardi, Albert; Carroll, Marcelle; Barlow, Reginald; Laffey, James P.
Monsieur De Ronsard (Major Reginald Barlow), Adele’s father, reacts with shock. Still photograph of scene in “Love’s Flame,” 1920. Plot: After his plane is shot down in flames, Capt. Clay, a young American aviator, is rescued by Frenchwoman Adele De Ronsard and taken to her family chateau. During his convalescence, Clay falls in love with Adele, who is caring for a small child whom Clay assumes is hers. Ordered to return to his squadron at the end of the war, Clay declares his love for Adele de Ronsard and finds his affection is returned. There is an awkward moment by the appearance of not one but two of Adele’s former suitors. The first, Maurice, she supposed dead in a military prison before she accepted the second, St. Gaudens. When they hear the crying of the child and jump to the conclusion that the child is Adele’s. Clay’s strong appeal to their sense of honor and fairness is overheard by Adele, confirming her judgment. She returns the rings of her former admirers, to their evident relief, and gives her hand to Clay. Clay asks Adele's father, M. De Ronsard, for her hand in marriage. De Ronsard refuses to allow his daughter to marry a foreigner, and so Clay and Adele agree upon a ruse. They enter one of the bedrooms of the house together, and De Ronsard, believing that his daughter has been compromised, insists upon their wedding. After Adele's sister confesses that she is the mother of the little war baby, Clay and Adele go away together. Carl Louis Gregory was director and cinematographer; Louis Reeves Harrison wrote the screenplay and story; produced and released by: Fidelity Pictures Company June 19, 1920. The cast featured Thomas Carrigan as Capt. Donald Clay); Vivienne Osborne as Adele De Ronsard; Cora Williams as Mathilde; Alexander Rene as Maurice; J. Albert Hall as St. Gaudens; Albert Roccardi as Monsieur Brisson; Marcelle Carroll as Mme. Julia; Reginald Barlow as Monsieur De Rosard; James Laffey as The Mayor. BW photograph; 8" x 10"